This pictorial book is about my athletic career and experiences as a player, coach and official during five decades. I am happy to say that Volleyball has been a major part of my life's journey. It is a sport I have loved all my life on and off the court. The game has been exciting, challenging, interesting and fulfilling in many ways.I hope this book which I am leaving behind survives me. Many photos shown here are chosen samples of what I have collected and those I had the fortune of meeting over the years. I have travelled across Canada playing varsity volleyball, participated in many tournaments in North America, coached several teams, officiated numerous games, had the pleasure of knowing many players and establishing friendships. It has been a wonderful journey which I cherish dearly. All in all, it has been a great and enjoyable experience. 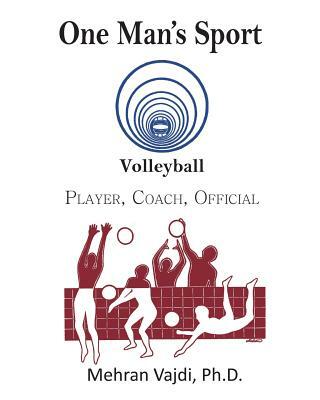 To my New England and New York friends, this book is also about us as volleyball players. Keep the ball rolling. Persian-born Mehran Vajdi is a U.S. citizen and a retired scientist. He received his B.S. and M.S. from the University of Manitoba in Canada, and holds a Ph.D. in lipid chemistry from the University of Massachusetts and a post-doctorate in analytical chemistry in collaboration with the U.S. Army Natick Laboratories. He is a recipient of the Sigma Xi award of the Scientific Society of North America, and is the author of over 25 scientific papers. Dr. Vajdi is also an artist and an award-winning athlete who spent 50 years playing and coaching competative volleyball at the collegiate, regional, and national levels, and served as president of the Yankee Volleyball Association.